If you are in the Salem. 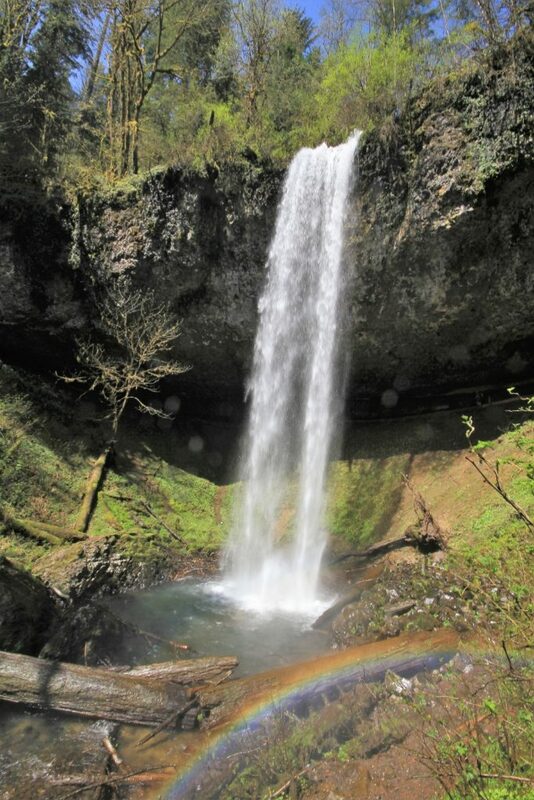 Oregon area and want to see a beautiful waterfall without the crowds at Silver Falls State Park, then Shellburg Falls is for you! Like several of the falls at Silver, you can walk behind this 100′ tall falls and you’re likely to catch a colorful rainbow on a sunny day. 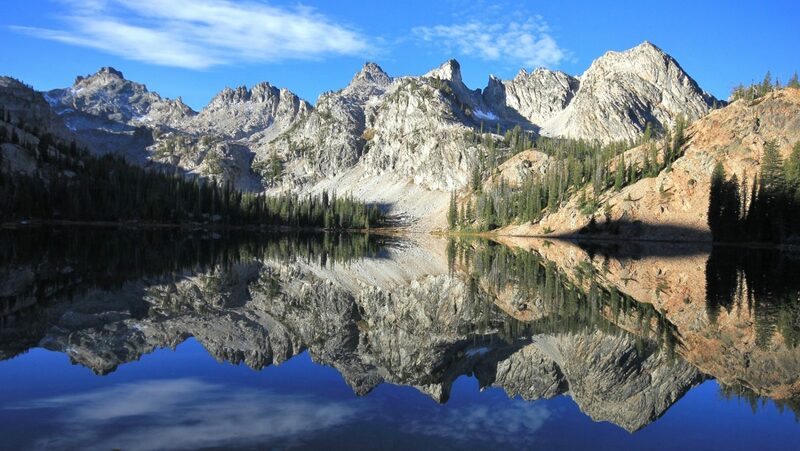 In the mood for a short easy hike? It’s just a mile and a half (one way) along good trail to the falls. 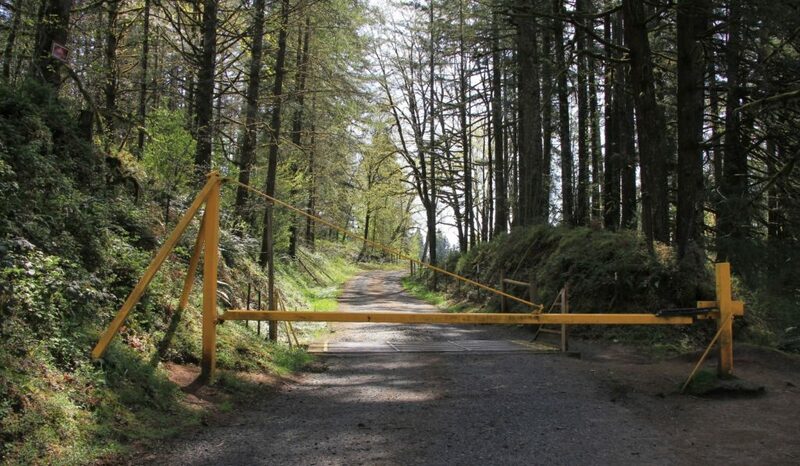 Want a longer trek? 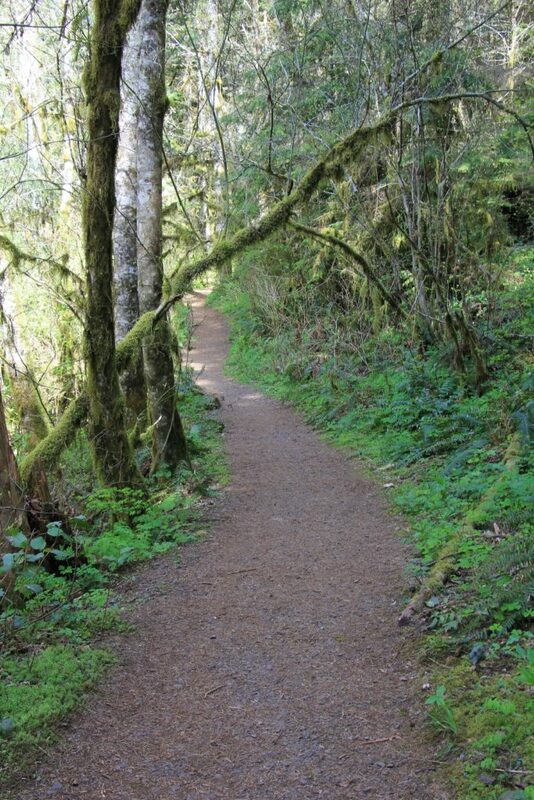 Continue past the falls on well maintained trails for a lovely loop through Santiam State Forest. After starting the day with a short hike to beautiful Steelhead Falls north of Bend, Oregon, we began our drive west toward Salem. Our route took us over Santiam Pass where we treated to fantastic views of snow-covered Cascade peaks and raging rivers. 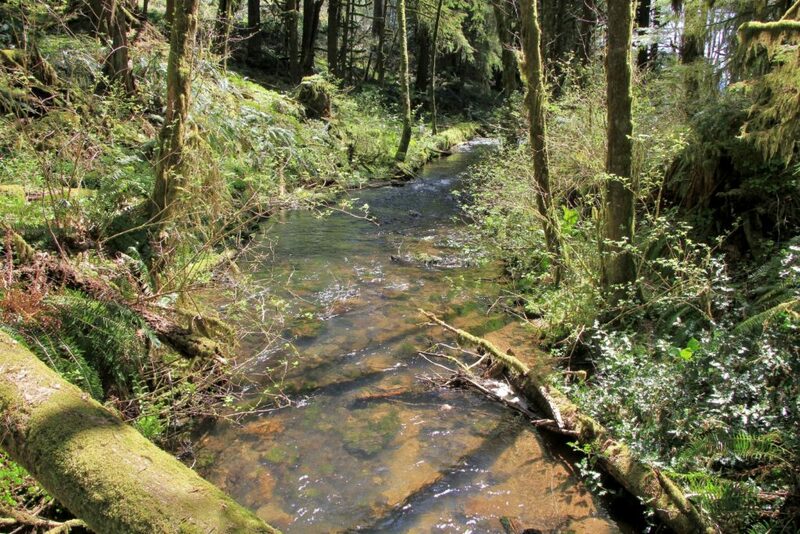 In the tiny village of Mahama, we turned onto Fern Ridge Road and continued just 1.2 miles to the signed trailhead for Shellburg Falls (1,047′ elevation). I don’t typically refer to small towns as villages, but this town has a gingerbread house, so it seems only fitting! 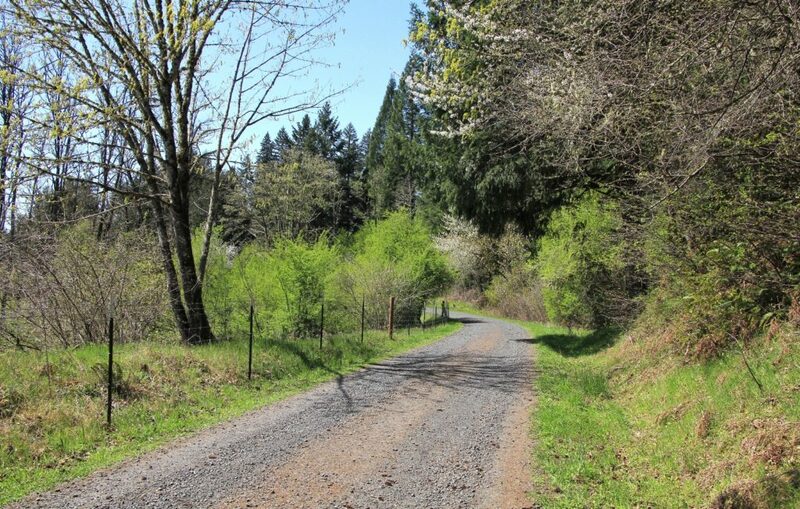 The trail to Shellburg Falls started up a gated, single-lane gravel road. 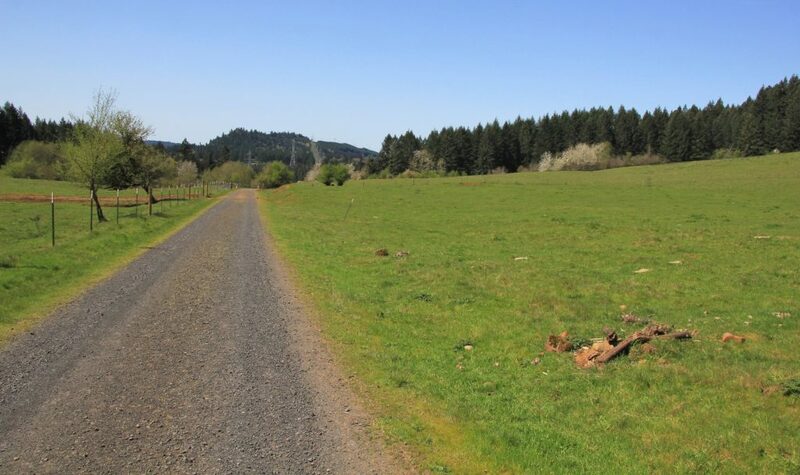 There were private property signs on both sides of the road as we hiked through the Oregon countryside passing a lovely green cattle pasture and a tree farm. 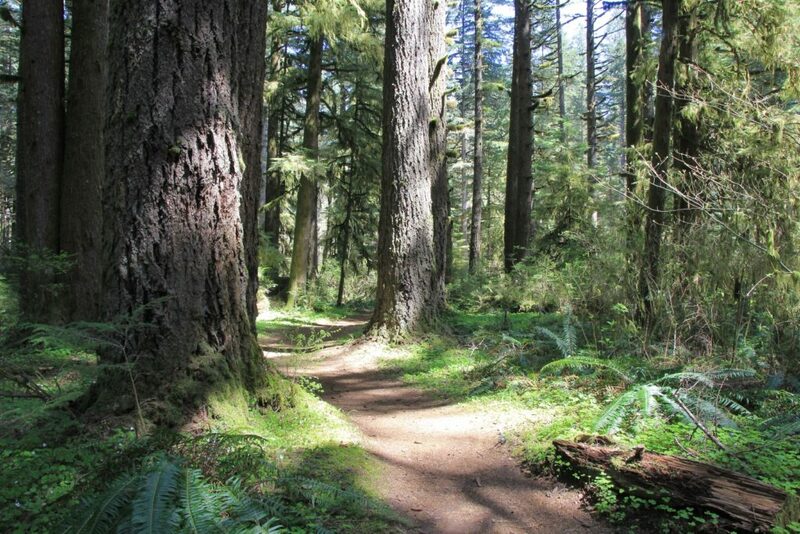 At a mile in, we entered Santiam State Forest. We were still hiking on road, but it began to feel more like a nature experience as the forest became more dense around us. At 1.3 miles, we came to a concrete bridge over Shellburg Creek. 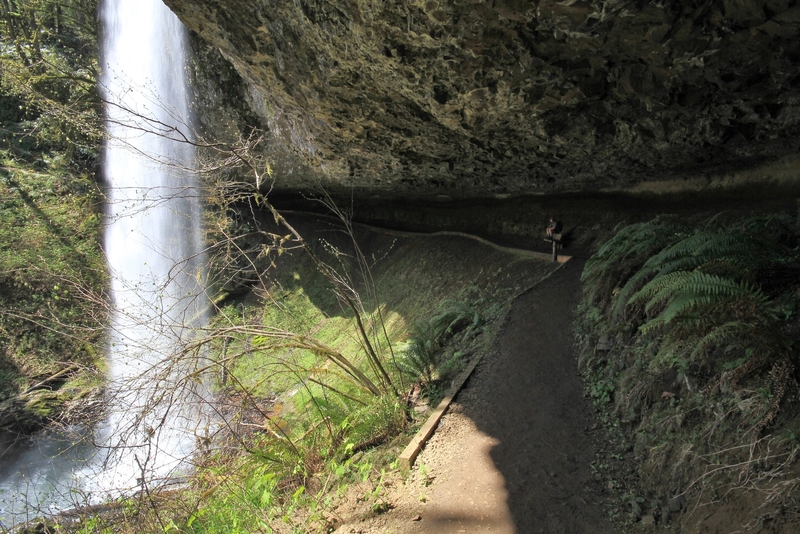 Here we had a nice view of the top of 40′ Lower Shellburg Falls. 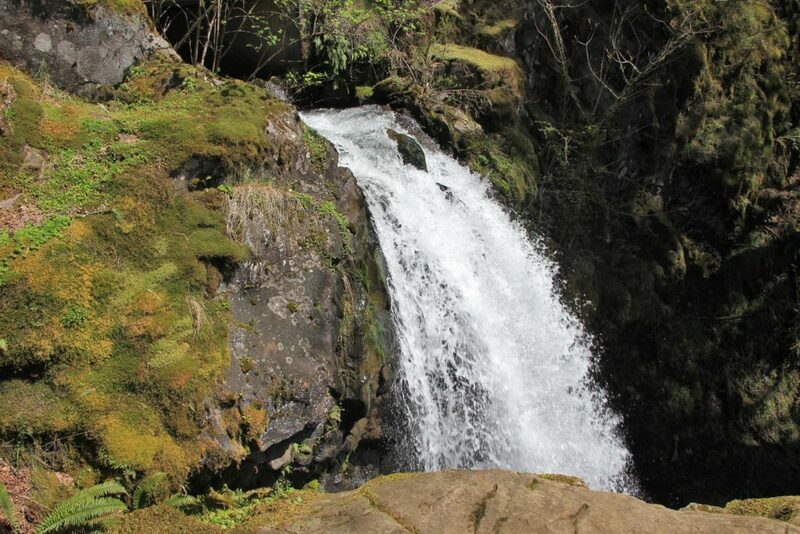 Apparently this is a beautiful two-tiered fall that is best viewed after a sketchy scramble down the steep hillside. I made myself content with a couple shots from the top before continuing on to the main falls. 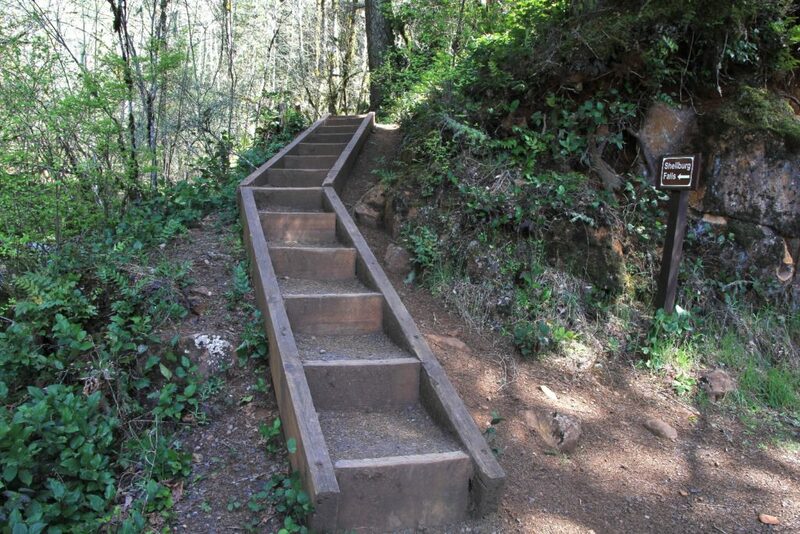 After crossing the bridge, we turned left, climbed a set of wooden stairs, and started up a well-maintained trail. 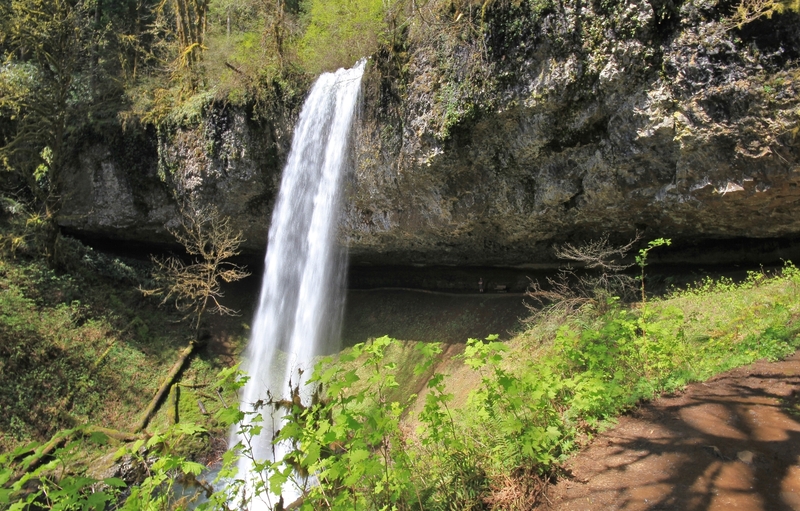 After just a quarter mile we came to Shellburg Falls (elevation 1,650′). 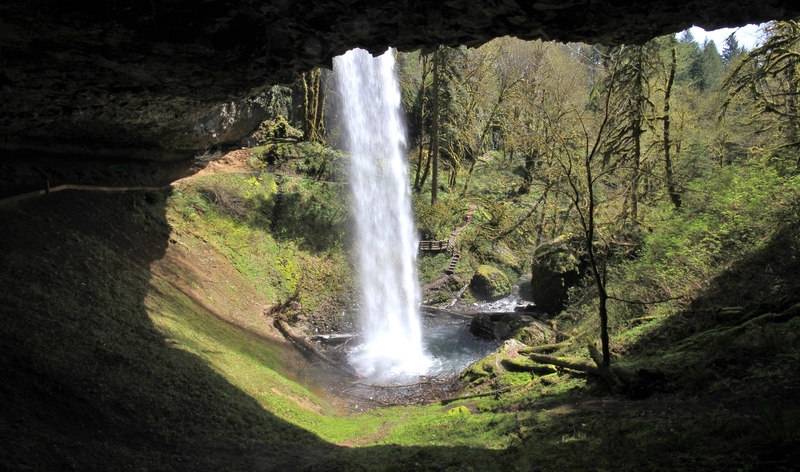 Shellburg was as spectacular as anything we’d see the following day at Silver Falls State Park but without the crowds. The falls are 100′ tall and there was a beautiful rainbow at the bottom. A short side trail took us down to a nice viewpoint where we got a little wet from spray, but had a phenomenal view. We continued up the trail which passed behind the falls. I always love the view looking out from behind a falls. The couple of people we saw at Shellburg turned around there, but we continued on. 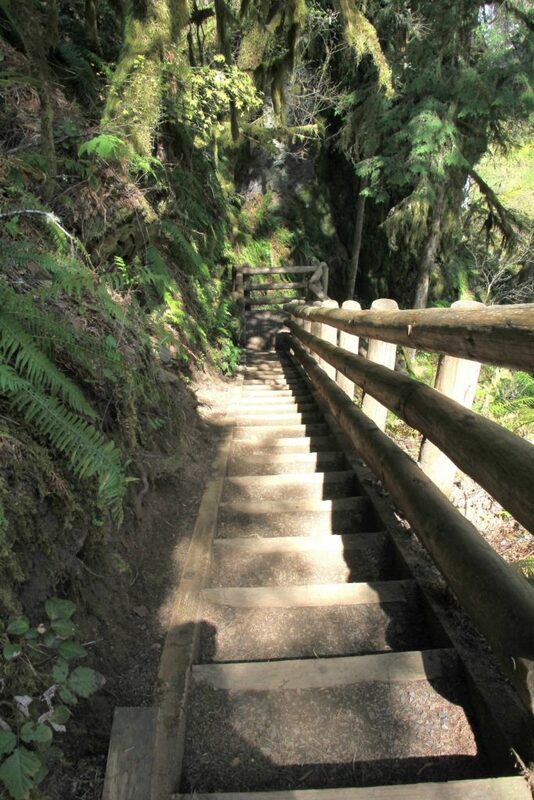 After passing behind the roaring falls, we climbed another set of stairs and continued half a mile to a campground. 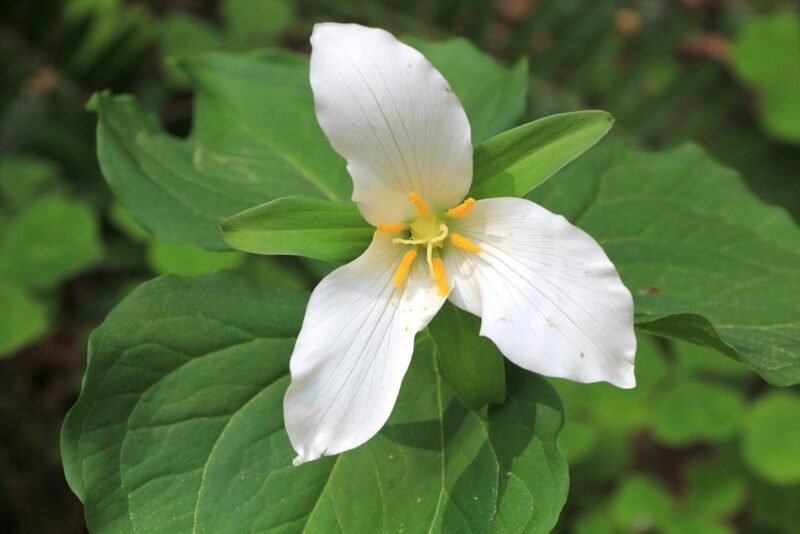 This stretch had some nice wildflowers including trillium in bloom. At the campground (which was completely empty), we struck up a conversation with a couple that appeared to be in their late 50s. They live in Salem, but were originally from the eastern side of Oregon near where we backpack in the summer. We quickly fell into comfortable conversation as we discussed the less populated side of the state. Preparing for our return hike, I could see a couple different trails taking off from the campground. I asked which one we should take and they invited us to hike with them. We gladly took them up on their offer and enjoyed more fine conversation. I became so engrossed in our conversation that I can’t say for sure how we returned to Lower Shellburg, Our trail map had showed returning via the Vine Maple and August Mountain trails; however, our trail friends said something about us being on a new trail system and it did appear that we left the campground from a different direction than we had anticipated. Whatever the route, we traveled through the forest on good trail with our acquaintances in the lead. Soon enough, we dropped out at the top of Lower Shellburg Falls. Before parting ways, we asked where the best burger in Salem was (always ask the locals). Without hesitation, they recommended Bo & Vine, a burger and wine bar. 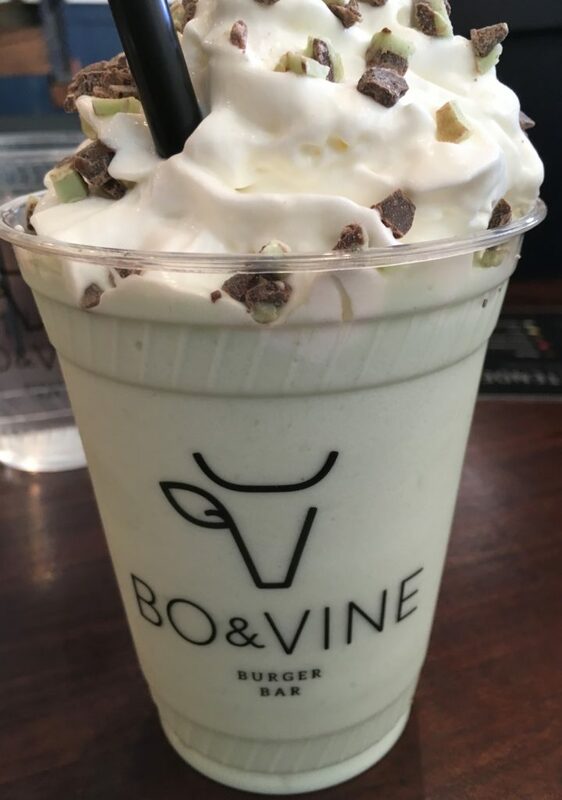 Post hike burger: Arriving in Salem, we headed straight for Bo & Vine. I wasn’t sure what to expect— burger and wine bar? Would we find a pretentious and high priced establishment passing a slider sized burger off as a real meal? To our surprise, we found a delightfully casual, yet trendy place not far from the university. 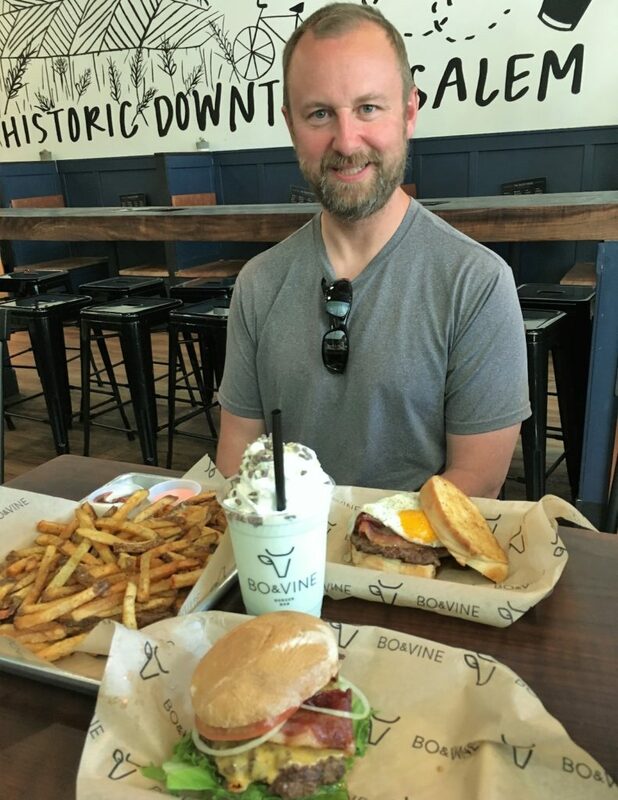 After a thorough study of the menu, we walked up to the counter and placed our order: a Bo & Vine (classic cheeseburger) with bacon added for me and an O Canada for Jason (bourbon maple reduction, fried egg, smoked bacon, Tillamook cheddar, housemade sweet bacon jam, and mayo- wow!). We each tacked on a mint milkshake and a small fry to share. The waitress said it was happy hour and that the “shareable” size of fries was the same price as a small, did we want that? Sure, why not? What we got was a massive pile of food and our choice of TWENTY different fry sauces! Oh and that shareable order of fries? It took up an entire TRAY. It was more food than our hiker sized appetites could consume. Everything was delicious and we’d put the burger in the top dozen we’ve ever had. We give this burger experience an A rating. 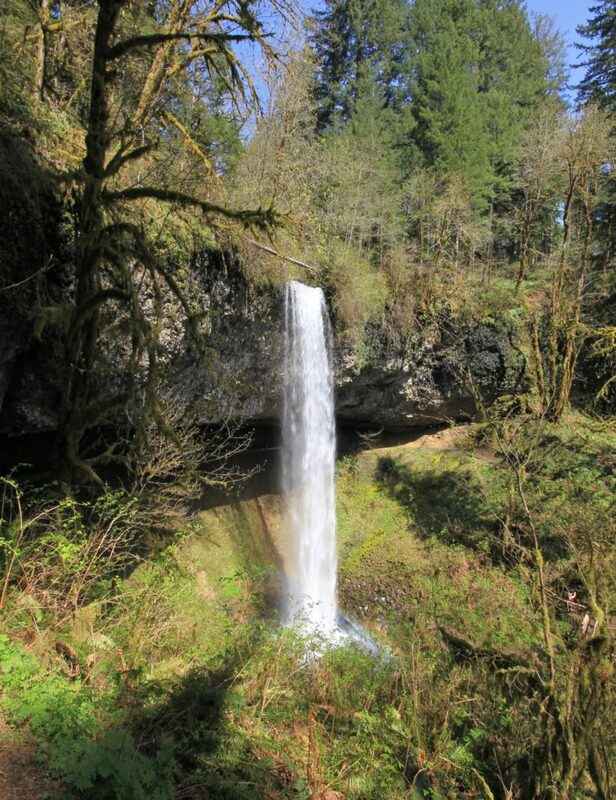 Directions to Shellburg Falls Trailhead: from exit 253 off I-5 in Salem, Oregon, travel east on North Santiam Highway 22 for 22.4 miles and turn left onto Fern Ridge Road. Continue 1.2 miles uphill to a small parking lot on the right side of the road. There is room for 6-8 well-parked cars. You know all the best waterfalls Rich!